This thangka was commissioned by my wife, Judi Sion Kenyon, and me in 2006. 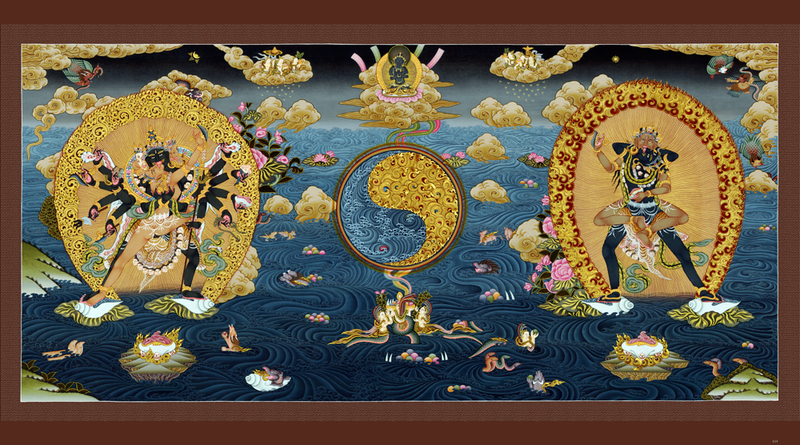 Our intention in commissioning this unusual thangka was to depict the inherent balance that exists between the enlightened male and female aspects of consciousness. The central figures are two potent Tibetan Buddhist Tutelary Deities: Chakrasamvara and Vajrayogini. The image on the left side of The Thangka shows Chakrasamvara facing the viewer while embracing his consort, Vajrayogini. This is the traditional way these two deities are represented in tantric embrace within Tibetan Buddhist iconography—with Chakrasamvara in the dominant position. On the right side of the thangka the positions are reversed, with Vajrayogini facing the viewer while embracing her consort Chakrasamvara. This is a highly unusual depiction of the deities in which a feminine aspect of Enlightened Mind is shown in the dominant position. In point of fact this representation is so unorthodox the original thangka painter we commissioned to paint The Thangka said he could not, in good conscience, show Chakrasamvara in a lesser position to Vajrayogini. He could only paint the portion of The Thangka that depicted the traditional visual relationship between the two deities—with Chakrasamvara in the dominant position. At this juncture in the project, another thangka painter stepped forward to complete the work. He was also a very talented thangka painter and was able to paint the remaining portion in the same style as the first painter. Between the two figures is a non-Buddhist element—the Taoist Yin and Yang symbol—an artistic element the artist added to show the ever-constant interplay between yin (the feminine principle) and yang (the masculine principle). In my opinion, the reluctance of the original painter to complete the project due to his discomfort with the act of depicting a new presentation of the two deities speaks volumes. For him there could only be one depiction and to paint something so radically different as to bring the feminine deity into equal footing and equality with the masculine deity was, perhaps, a type of heresy. I was not able to actually speak with him about his inability to finish the project as our connection was through a third party. But his reluctance to complete the painting was, for me, a poignant statement. Here we had a highly regarded Tibetan Buddhist thangka painter who, at first, was very excited about the prospect of such a thangka. But as he engaged his skills to execute the vision, he encountered a deep vein of apprehension in himself that he did not, at first, recognize. I imagine had he known about his unconscious reluctance to raise the feminine in balance to the male, he would not have accepted the commission to begin with. I suspect that as he entered into the meditative states required by highly gifted thangka painters, he ran into a type of philosophical “brick wall.” This wall had been laid brick-by-brick over the course of his life. Each brick reflected the values he had absorbed from his culture and from his sangha, which evidently viewed the place of feminine deities in relation to male deities in a rather rigid manner. Furthermore, if we look into his choice-making more deeply, I suspect that some of the bricks in his philosophical wall included attitudes regarding the rightful place of women in general. All of these elements, and perhaps others, contributed to a type of artistic paralysis. And the vision of a new iconography stalled as he held his brush to the canvas. When Judi and I finally received The Thangka and were presented with the dramatic story of its creation, it spoke directly to the impediments within a patriarchal society that arise whenever one attempts to raise the feminine to an equal footing with the masculine. Iconography is a powerful means to convey multiple layers of meaning and all Buddhist thangkas—to a greater or lesser degree—use this artistic device to emanate qualities of consciousness to the receptive minds of Tantric Practitioners. In this section I wish to discuss some of the iconographic aspects of The Thangka: how it relates to female Bodhisattvas and Buddhas within the Exalted Sangha, how it relates to Buddhist Tantra in general, and finally how it relates to the historical place of women Practitioners and Teachers within the Buddhist Sangha. (Note: For those unfamiliar with these terms, the sangha refers to a group of Practitioners who join together, from time to time, to receive teachings and/or engage in Dharma activities. The Exalted Sangha refers to the community of the Enlightened Ones—those who have perfected themselves and have attained a high level of attainment. This includes both male and female Buddhas as well as male and female Bodhisattvas). I offer these thoughts, not as a scholar, but rather as a fellow Practitioner. And it is my sincere desire that the iconography of Chakrasamvara and Vajrayogini will inspire you as much as it has inspired me to understand the Dharma and the rightful place of men and women within it more deeply. A Tutelary deity is used as a point of focus during some tantric meditation practices and/or rituals to contemplate the qualities associated with that deity. Tutelary deities are not creator gods or goddesses in the usual sense. They are more like archetypal forces that can interact with the consciousness of a yogi or yogini. Taking this a step further, in Deity Yoga a Practitioner actually merges his or her mind with the Enlightened Mind of the Deity to draw to himself/herself the qualities of Enlightened Mind that the Deity exemplifies. In this advanced form of tantric meditation, the practitioner is encouraged to recognize that these qualities of Enlightened Mind are not separate from him or her but are inherent within his or her own Buddha Nature. While the interplay between Chakrasamvara and Vajrayogini is very complex, I think it may be helpful to point out a few of the more salient points regarding this particular tantric relationship. At a deep archetypal level, the tantric union of Chakrasamvara and Vajrayogini means that they are, for most intents and purposes, two aspects of the same thing—Enlightened Mind. Within this context, both Chakrasamvara and Vajrayogini are manifestations of enlightened activity in which their individual and combined qualities can be brought to bear in tantric meditations. But although they have their own unique attributes and powers, they are, in the most elevated sense, expressions of One Mind. Before we proceed any further, it would be good to note that different tantric scriptures as well as traditions view Chakrasamvara and Vajrayogini somewhat differently, and the spellings of their names are also different—especially when translated into English. For our purposes, a basic view of these two tantric deities will suffice. During Tantric meditations and rituals, the union of these two principles (“bliss and/or right method” and “emptiness”) is used to generate enlightened states of mind. In other words, when we are aware that all phenomena (including ourselves) are essentially empty and devoid of substance and then generate bliss—as well as engage the “right method” of meditation or tantric ritual—our consciousness will spontaneously generate highly refined and elevated states of awareness. I feel it is important, at this juncture in our discussion, to point out the fact that this emptiness is not the same as nothing. The type of emptiness that Vajrayogini represents is actually a highly refined state of cognizance (transcendent awareness) and is directly related to the Prajnaparamita (sometimes referred to as The Mother of All the Buddhas). This feminine aspect of Enlightened Mind is firmly rooted in the transcendent knowledge whose ground is primordial awareness itself—specifically the awareness that all phenomena are temporary displays of consciousness, transient and possessing no substance. This insight into the empty nature of all things naturally occurs when our minds are empty, self-aware and devoid of thinking. This empty mind rests, at ease, in its own naturally aware state without the need to impose anything or any activity upon it. Just as the relationship between the bell and dorje expresses the union of “bliss and/or right method” and “emptiness,” the relationship between Chakrasamvara and Vajrayogini also depicts a similar union. But before we explore their tantric connection further, I would first like to discuss them as independent archetypal forces. The image above is from the left side of The Thangka where Chakrasamvara is the primary figure. Chakrasamvara is also known as Samvara, a potent form of Heruka, which is one of the principal yidam meditation deities of the Sarma schools of Tibetan Buddhism. Samvara is most often depicted with a blue-colored body, four faces and twelve arms. In Western translations of meditation texts Samvara’s name is often translated as “Highest Bliss.” Meditation on Chakrasamvara is an advanced meditation practice that is transmitted by one’s lama and effectively binds the mind of the meditator to the state of enlightenment. As a result, these types of meditations should not be entered into lightly, and it is strongly advised that such advanced tantric meditations be conducted with the guidance of an authentic lama, meaning one who is clearly within the lineage. The archetypal nature of Chakrasamvara empowers us to use our inherent enlightened ability to simultaneously operate both within the worlds of samsara (illusion) and nirvana (absolute truth and bliss). This capacity allows us to be of greater service to other sentient beings due to the fact that we gain greater insight into the circumstances of samsara and thus know how to deal with difficult situations more effectively. 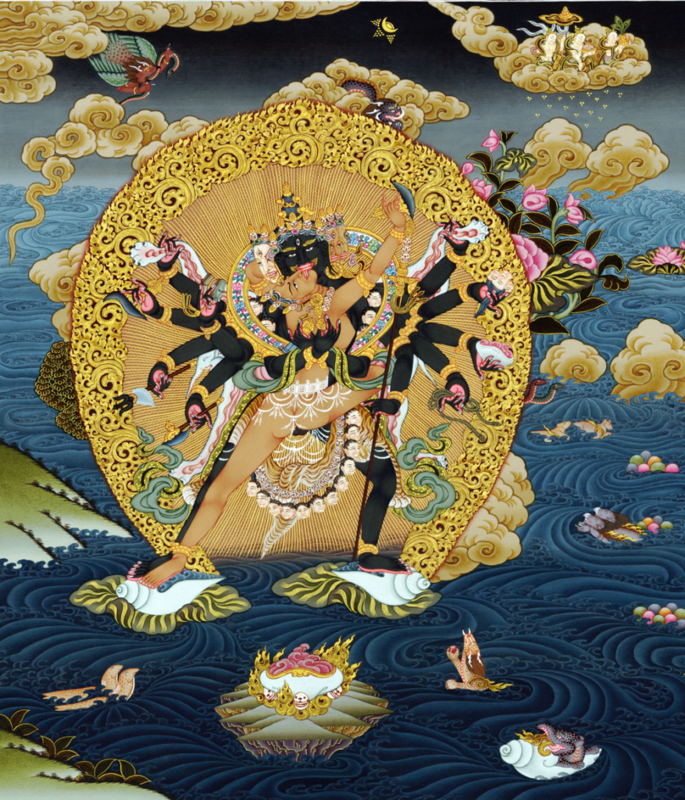 The image above is from the right side of The Thangka where Vajrayogini is the primary figure. Vajrayogini is a female Buddha and dakini whose essence is said to be “Great Passion.” This is a transcendent passion, free of all selfishness and samsaric illusion. She works tirelessly and intensely for the well-being of others and destroys ego clinging through her fiery nature. She is thus viewed as being well-suited for persons with strong passions by providing a means to transform all passions into enlightened virtues. As a meditation deity her practice includes methods for transforming ordinary experiences, including death, into paths of enlightenment. As I mentioned earlier, Chakrasamvara and Vajrayogini represent the union of bliss and/or right method along with emptiness. This type of union leads to enlightened states of mind, and this is one of their great Tantric secrets. At another level, they represent male and female sexual energies. By this I don’t mean external sexuality as in men and women but more the internal sexual energies, what Carl Jung referred to as the animus (internal male) and anima (internal female). This type of archetypal sexual energy expresses itself in both sexes. 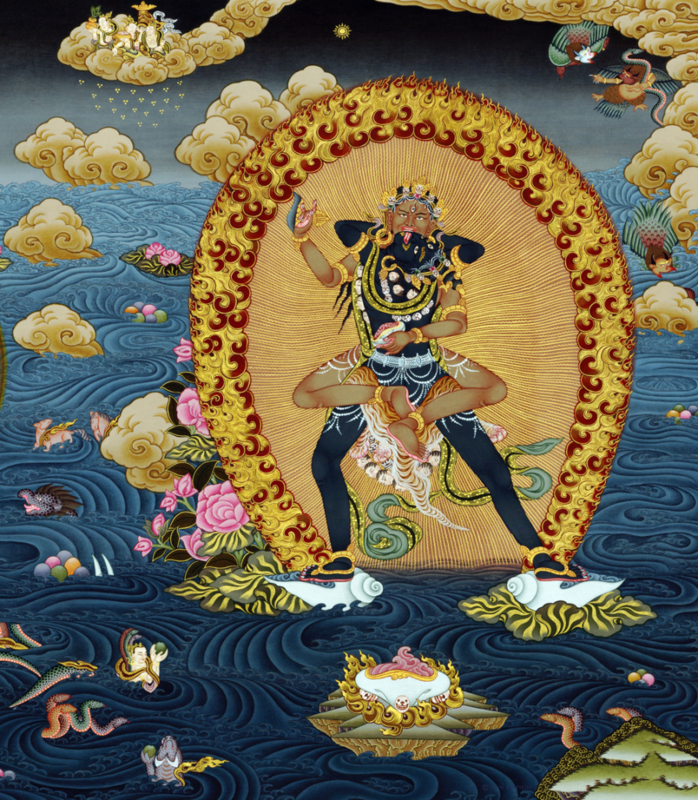 And the elevation and transformation of this primal energy into Enlightened Mind is one of Tantra’s great undertakings—symbolized in potent brilliance by the depictions of Chakrasamvara and Vajrayogini in ecstatic tantric embrace. I would now like to move our discussion from Chakrasamvara’s and Vajrayogini’s tantric natures, and their intricate relationship, to the impact of how their historical iconographies have affected, and continue to affect, Buddhist sanghas. If we recall the story of the first thangka painter’s inability to complete The Thangka due to his issues with raising the feminine in equal footing to the male, we have—I think—the nexus or kernel of the problem. Most schools of Buddhism acknowledge that there are innumerable feminine Buddhas and Bodhisattvas who exist throughout all realms and in all times. And it is generally acknowledged that these highly elevated feminine beings are on equal footing with their male counterparts. In spite of this, however, there is still a deep and formidable patriarchal bias that runs throughout many, if not most, Buddhist sanghas. As a result, feminine Practitioners and Teachers are often viewed as lesser than their male contemporaries. And I believe this is the case even if such opinions are not actually spoken out loud. In fact, I feel that unspoken thoughts are often more powerful than those that are articulated openly—and can thus do more harm because they can be cloaked by outward appearances. If the Buddhist scholar, Miranda Shaw’s, observation that Vajrayogini is “inarguably the supreme deity within the Tantric Pantheon” is true, (and I believe it is), what terrible tragedy has befallen the feminine principle within our Buddhist sanghas and throughout the world? I ask this questions, not as a scholar, but as a fellow Practitioner who sees within myself the harm that is done to the very underpinnings of Tantra when the feminine is divested—knowingly or unknowingly—either in the realms of iconography, philosophy or in the relationships that arise between men and women in our everyday lives where, ideally, the Dharma is actually lived. When Judi and I commissioned a new version of the traditional Chakrasamvara and Vajrayogini’s iconography, it was to introduce a new artistic vision of equality. It was just one small pebble tossed, metaphorically, into the waters of our collective mind. How each of us embraces or rejects such a vision is, of course, a personal matter, but I believe that the future course of Buddhism and any Perennial Philosophy, for that matter, will depend upon how the feminine is viewed—meaning will she continue to be held in a submissive and less important position or will she be elevated to her rightful place of equal importance to the masculine? On one of our subsequent trips to Tibet, after commissioning The Thangka, we had an unexpected opportunity to put into action the vision of this new iconography. Our guide, Ken Ballard, had arranged to take our group to hear the chanters at the Gyantse Nunnery as part of the tour. Both Judi and I were awestruck by both the beauty and the musical mastery of the nuns. To say that their voices transported us into other dimensions of awareness would be an understatement. On our next trip to Tibet, we came armed with recording equipment and recorded the nuns of Gyantse. Those recordings became part of what was to be called The Nun Project. The vision was simple—to record indigenous female singers and chanters and to release these recordings to the world. Judi was also clear that all profits would go directly back to those whose voices were recorded—ending a long term pattern of the West—which was to take from indigenous peoples without giving anything back. Our trip to Tibet was paid for, not by the Sound Healing Foundation, a 501(c)3 non-profit, which oversees The Nun project, but by those who attended the tours. Even those who recorded paid their own way. From here, we eventually wound up in Bhutan and with Ken’s connections were able to record the CHOD ceremony conducted solely by women. To our knowledge this is the only recording of an all female CHOD choir—a tribute, to both Vajrayogini, who is directly connected with the CHOD and with Yeshe Tsogyal, Padmasambhava’s consort and a powerful Tantric Practitioner in her own right—who is also connected to the CHOD through one of her reincarnations as Machig Labdron. We were also able to record The Bardo Prayers by a group of nuns in a remote area of Bhutan as well. In a very real sense, these recordings express an embodiment of The Thangka’s new iconography. They do this by raising awareness of both the existence of, and appreciation for, these remarkable feminine voices, rich with the cultural history and traditions of Buddhism as realized in both Tibet and Bhutan. You can hear a sample of these recordings and, if you so choose, purchase these recordings from our online Store knowing that all of the profits will go back to the singers’ and chanters’ nunneries. This two-CD set includes a White Tara Ceremony as well as A Guru Ceremony. These recordings were the seed for The Nun Project. A two-CD set.